Great design balances artistic techniques and principles with scientific precision. And that combination gives us designers a lot of tools to work with. First, you have the basic principles of design. While each design discipline employs these differently, you’ll find the same considerations at the core of each practice: balance, color, texture, proximity, etc. These form the foundations of all forms of design. Then, layered on top of these foundational elements, you have the various tools we use to implement those principles. You might use digital applications and frameworks, like InVision for collaboration, Pinterest for inspiration, and Bootstrap to set parameters. Or, you might kick it old school and grab your trusty pen and paper to sketch out your ideas. Either way, you’ve developed some methods and habits that help your creativity flow. But even with all these tools, you’ll occasionally hit a wall with a design. Maybe you’re facing rigid project restrictions, or you’ve slipped into an agonizing state of “analysis paralysis.” Before you join Pixel Pushers Anonymous to vent your frustrations, take a step back and look at all the possibilities available to you. 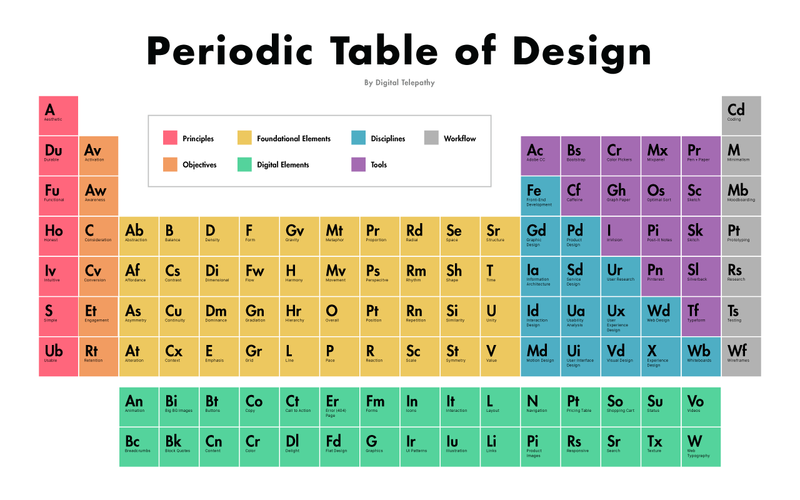 Look at the Periodic Table of Design. With a pinch of this and a dash of that, you could create a brand-new compound and bring your designs to the next level. Or you might go all mad scientist on your design and try new combinations you’ve never dared before. Sometimes all it takes to get over a hump is to remember all the little elements that combine to form a great design—all ingredients available to you. And don’t keep the inspiration to yourself. Share it, blog it, pin it, tweet it, or save it to your desktop—here’s the full size version. It’s your resource now—use it as you please. Brent is a veteran team leader who is fascinated by the intersection of data, design, and content. New recipes and saisons fill much of his time.